A bite into and not all of the World's news and knowledge! i BELEiVE iN MUSiC – i BELEive iN LOVE(Evol-Evil)! [ yO CREO EN LA MÚSiCA – yO CREO EL EL AMOR(Roma)! …4 days of illegal detention and torture in the USA – 4million$ to be paid…! SAN DIEGO – A 25-year old college student reached a $4.1 million settlement with the U.S. government after he was abandoned in a windowless cell for more than four days without food or water, his attorneys said Tuesday. Daniel Chong said he drank his own urine to stay alive, hallucinated that agents were trying to poison him with gases through the vents, and tried to carve a farewell message to his mother in his arm. It remained unclear how the situation occurred, and no one has been disciplined, said Eugene Iredale, an attorney for Chong, The Justice Department’s inspector general is investigating. “It sounded like it was an accident — a really, really bad, horrible accident,” Chong said. Chong was taken into custody during a drug raid and placed in the cell in April 2012 by a police officer authorized to perform Drug Enforcement Administration work. The officer told Chong he would not be charged and said, “‘Hang tight, we’ll come get you in a minute,'” Iredale said. Justice Department spokeswoman Allison Price confirmed the settlement was reached for $4.1 million but declined to answer other questions. The DEA didn’t immediately respond to a request for comment. WOW YOU TELL ME HOW MUCH I AM ENTITLED TO IN THE SOON TO BE MY CASE of human rights…??? 4 times 3 weeks under torture and denigration labels of my person, under Canada mental health act, for really no reasons other than a reprimand…! With menace for it to be made compulsory to home detention an obligatory torture of medical psychological medications that cause you real bad mental and emotional conditions…!!! CANADA IS A NICE COMMONWEALTH COUNTRY, but with this one, they pupu’d themselves and shot themselves in a foot…! UNITED NATIONS IS AWARE, and soon further sanctions will happen…! IS THE EARTH FLAT…? Yes as the old belief, BUT WITH NO EDGE…! Making it a SPHERE, or GEOID…! Trying to explain the topology of the Universe is really complicated… for humans. But it clearly comes naturally to Zogg the Alien from Betelgeuse. In this 10-minute video, the plucky alien vividly describes how we could have a Universe which is flat and finite, but doesn’t have an edge. How we could travel in one direction and return to our starting point, never bumping into the outside of the Universe. 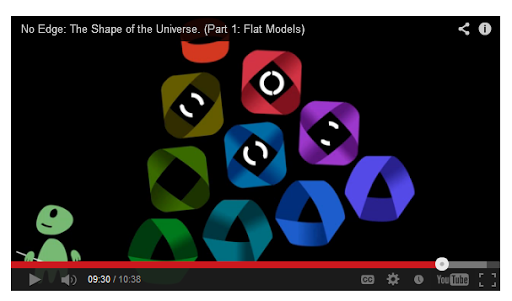 …I agree that these so called flat models of a finite Universe make more sense than the Big Bang Theory and an Expanding Universe into nothing or bending in onto itself, etc….! …anagrammatt for "friday" 26 july 2013…! 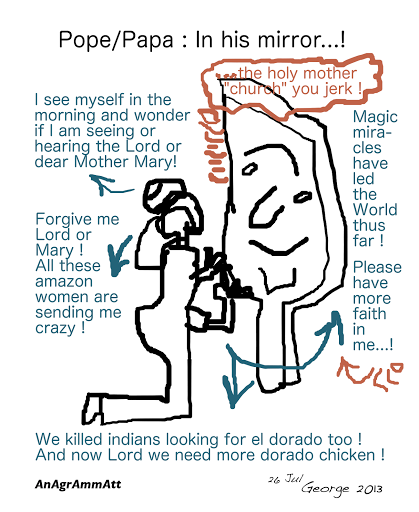 Holy Pope/Papa and "Holy Mother Mary"…! …proven, but until it really happens, we won’t know the real truth…! World governments and economists are knutty and destroying us all…! The rapidly melting Arctic is an “economic time bomb” that will cost $60 trillion or more over the next 10 years, say a group of European economic and science researchers. That staggering number approaches the $70 trillion value of the entire world economy in 2012, the scientists say in a comment in the journal Nature. The researchers — Gail Whiteman, of the Rotterdam School of Management at Erasmus University in the Netherlands, Chris Hope of the Cambridge Judge Business School and Peter Wadhams, a professor of ocean physics at University of Cambridge, both in Britain — are urging creation of an economic model for the impact of climate change. …folks, this World’s nutty economists and nutty governments, are destroying us…! and for greed and false money gains…! …proven, but until it really happens, we won’t know the real truth…! World governments and economists are nutty and destroying us all…! …to Prince G. Alexander Louis…! Baby boy with a huge name…! The world’s most famous infant finally has a name: the little prince will be called George Alexander Louis, His Royal Highness Prince George of Cambridge, Clarence House revealed on Wednesday. There have been six kings with the name of George, but none named Alexander or Louis. The announcement raises speculation that if he were to become king the new prince would choose the name George VII, but there is no guarantee that as monarch he would use his first name. His great-great-grandfather, George VI, was christened Albert Frederick Arthur George and used his fourth name when he came to the throne. …Well I did not know that His Royal Highness Prince George of Cambridge, is the most important infant of the World…! As far as I know Barack Obama’s girls: Malia Ann & Natasha, are the most important so far…! But lets say that they are not infants now or adults…! I perceive these Obama girls to be of great logic, which I hope time and life does not modify…! 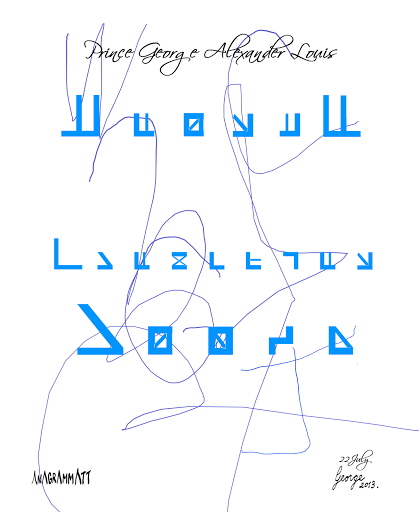 …Now William and G. Alexander Louis, I expect you to live up better, to better logic than the UK has so far…! You both have big names to live up to…! …There are no reasons for life bad conditions and poordom to exist anymore…! [-] When `will…’ the baby boy have his first “haircut”…? [-] When `will…’ we see his first toothie’s…? [-] When `will…’ we see him walking around in a walker…? [-] When `will…’ we see his first steps…? [-] And tra la, lahhh, laaaa, lahhhh, lala…! …to the new baby boy born to William and Kate – Duke and Dutchess of Cambridge…! 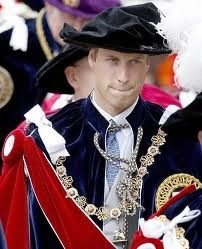 Duke & Dutchess of Cambridge [Buckingham] have a “new” baby boy…! …some people like making mixed and composed names for their kids…! and alive in the womb! to form this new being! sounds to become soon reality! and calling him to them! His cries will develop his voice to his wants! will be kept carefully from dashing a foot or fall! lest at any time thou dash thy foot against a stone. As none of most of our lives are! …anagrammatt for thu-18july2013…! 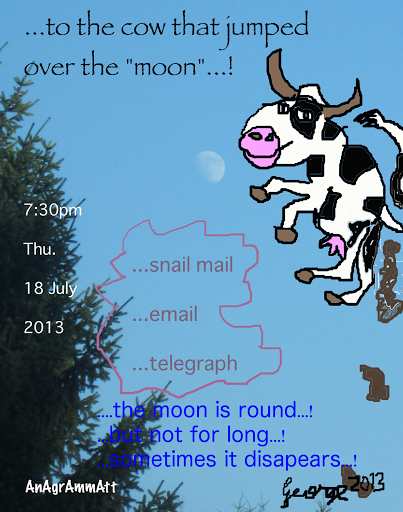 TO THE COW THAT JUMPED THE MOON…! 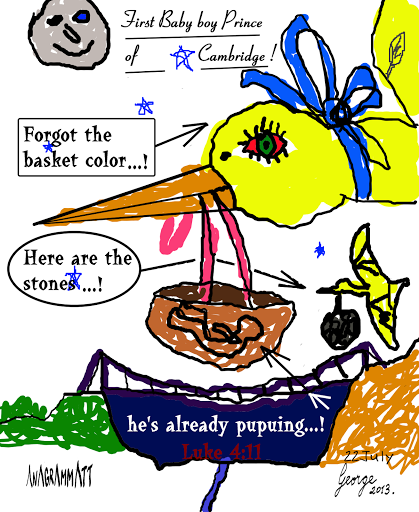 …ancient beliefs about the Moon were quite weird and of varied nature…! …THE MOON GOES AROUND THE EARTH, once every cycle of around a month, keeping always one face of course facing the Earth, as you would tie a ball and swing it around your head…! …The Sun of course does “illuminate” the “dark side of the Moon when the Moon is between the Earth and the Sun in its rotation around the Earth…! AND THE DARK SIDE OF THE MOON IS DARK, WHEN ON THE OUTER SIDE OF THE ROTATION, when the Earth is between it and the Sun…! …Happy, night time stories to both your kids and yourself…! I do not mind reading fables like the Lord of the Rings or other…! This is for all of all about Humans know ! Including a small bio of any website, theme, place, objects, things, books, movies, and about yourself or anybody ! more advanced logic for a world in dier need to be free !